PC Build Help. Noob Here! First post. I would like to see either a slight modification or some 'descriptions' added to help guide people posting with this format. 1. What YOUR PC will be used for. That means what types of tasks you'll be performing. My PC will mostly 90 percent be for gaming. The games I play are Counter Strike, Starcraft 2, DOTA, HON, BF3 and maybe get into Diablo 3. I'am a college student so once in a while use it for Microsoft word, Power point etc. I want this PC to run all my games really smooth at possible max settings? My budget is 2k-2.2k Somewhere around those lines? this includes all necessary components to run the actual PC, Mouse, Monitor, keyboard, OS everything. 3. What country YOU will be buying YOUR parts from. Not to sure but i've heard Intel is the way to go? 5. If YOU intend on using any of YOUR current parts, and if so, what those parts are. 6. IF YOU have searched and/or read similar threads. Ha lets see what i know. or what i have heard. I5>I7 intel processor for gaming. Dont get top of the line stuff. Gaming tech changes every year and price difference is craxy for best set up to second best set up. umm more memory the better. trying to max out on a 32gb memory? that about it? 7. IF YOU plan on overclocking or run the system at default speeds. I have no clue what that means. 8. WHEN do you plan to build it? I have nothing together and a family friend will put it together. He's alot older then me. Always busy I called/texted he never replied to me about what to buy. But im sure if I bug enough he will come to put it together lol. 9. What resolution and settings do you use? No 3d. but i'd like to run everything in max graphics if that makes sense? 10. Are there any specific technologies you want? I read that getting a SSD is really good for a nice set up. Um I5 is the way to go and I want to max out 32gb memory? These setups was what i was thinking..
Dont confuse size of screen with Resolution...as in a 60" Flatscreen is 1080....same as a 22" Monitor that is 1080...the higher the Resolution the crisper the details look. The Z77 chipset you have would be where to start, the I7 X79 chipset (the 2nd one listed) would likely be more than you need, unless of course you ultimately want the 2 higher resolution Monitors I pointed out above (2560 x 1440 or 2560 x 1600), then indeed the X79 would suit your needs fine. I think you should get a more solid commitment from your friend or do some research on doing a build, it's relatively easy but it's nice to have someone help the first time, especially if you're dropping 2 grand. Cool thanks for the setup ill look into it and see if I can buy that stuff @ tigerdirect. So I should start leaning more towards my second choice? Yea I think 1080 is good enough for me. I can't picture myself playing with a 27' or 30' screen. I'm happy with a 25 I guess. I don't think I would be able to tell the difference between 1080 and anything higher haha. Overclocking is when you take your processor for instance and make it run faster than it was meant to. For instance if you make a 3GHz Processor run at 4GHz thus making it faster. It seems that you are not going to do that in which case I wouldn't recommend going for a processor with a "K" in the name since that K means it's good for overclocking. So I'll recommend either a i5-2500 (no K) or a i5-3450 or i5-3570 instead of the i5-2500K you've listed in build #1. It'll save you some money simply because you don't need a K for a non-overclocking build. Should you however choose to overclock at a later point, you'll need a K-processor. Other than that I'd probably take i5 over i7, again to save some money where you don't need to spend them. You were talking about 32 gigs of RAM and while it is true that the more memory the better, at the moment I don't think you need to get anymore than 8gigs of ram. Heck, even 4GB should do the trick I suppose... Having ram in excess will not improve performance at all and you will never fill 32 gigs unless you do serious video editing. Last edited by Marute; December 23, 2012 at 10:01 AM. Ahh I see. Ya do t want to get into that, don't think the games I play will require that. 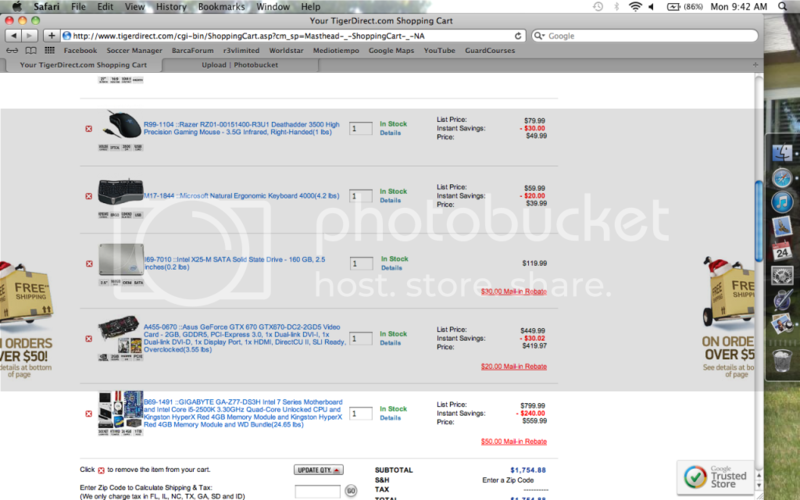 And plus with the equipment ill be getting (leaning more towards the second one I posted) think that should be good. Ahaha.. Yea I've had people tell me I don't need 32gb. I won't be doing any editing or running and software other than Microsoft word, power point and the games that I listed above. Well this is my pick. It's an Intel i5-3470 with 16GB of RAM and a Nvidia 660Ti video card. Motherboard is ASRock, which I never used before but seem to have decent reviews here. 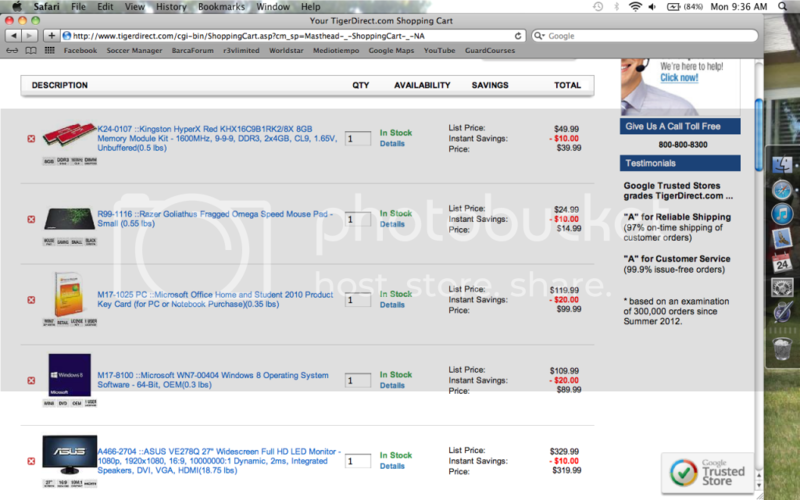 It's using the stock CPU cooler and doesn't have mouse and keyboard but it comes out to $1470 before tax and shipping. *Edit: If you swap the case to something like a Corsair 200R, you save another $40 but it's a full size ATX case and not a smaller mATX case. Don't know if size is going to be an issue for you. Thanks for the input guys think I'am going with this set up. K I keep changing MY mind But here it iS?!? !